Over the years I took many pictures of the marvellous tiles and earthenware products in Turkish museums as well as mosques, palaces, mausolea and so forth. I here throw many together. 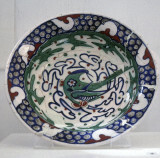 I leave out some wares that I don't care for, like Çanakkale ware, and too modern Kütahya. It may be worth your while to check with the galleries these pictures come from, as there you can see them in their surroundings (if they exist), like a mosque. Also, I cannot guarantee I did not overlook some. For the time being I include some Selcuk works, in due course I may migrate them to a similar, specialized gallery.